The beauty of this recipe is in the simplicity. It’s just a few ingredients, but the way the flavors work together, it’s like a symphony. In your mouth. And you will love it. I have always adored mushrooms. Their earthy flavor and tender texture have just always appealed to me. And they truly are the star of this dish. I’ve never seen funghi look so fancy! If you aren’t eating many mushrooms, you should be. Mushrooms are dense with nutrients. They are high in antioxidants, which help eliminate free radicals in the body. They also contain a mineral called selenium, which is not common in most other fruits and vegetables. It helps with liver function, and plays a role in detoxifying and preventing inflammation. 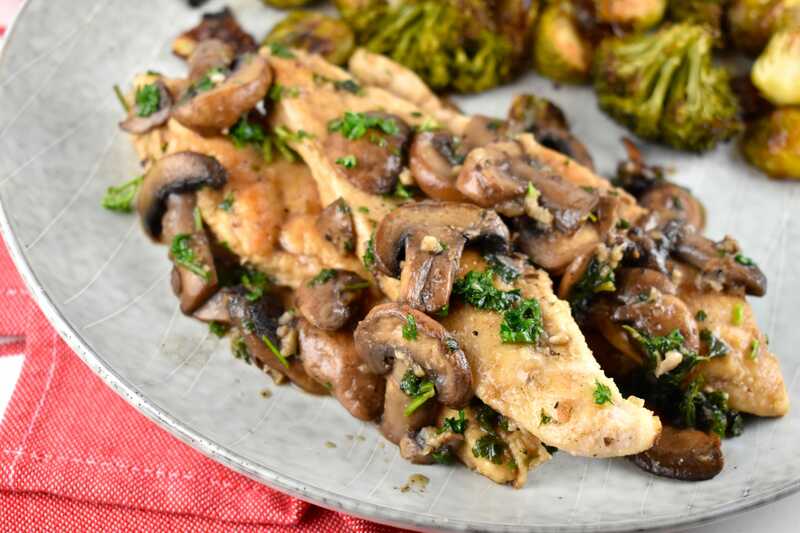 Additionally, mushrooms contain Vitamin D and folate. These are all great reasons to incorporate more mushrooms into your diet. That, and the fact that they are delicious. 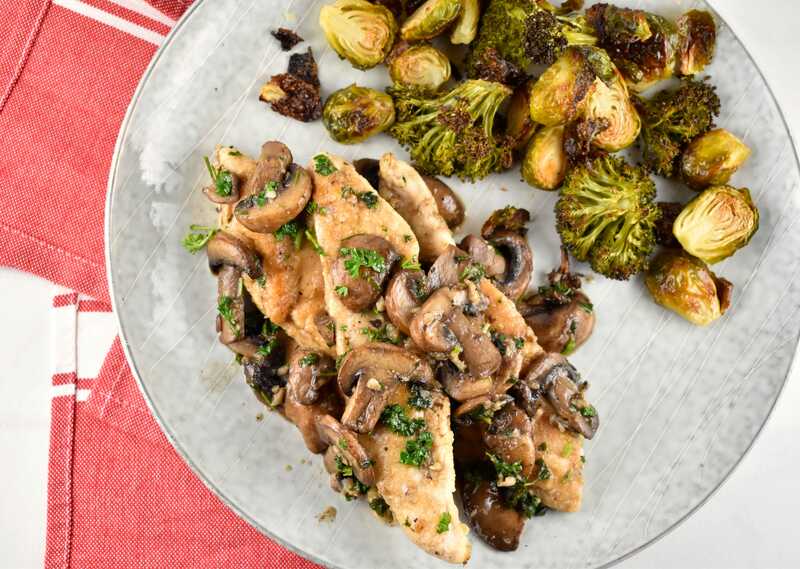 By keeping this healthy dinner recipe super simple, the complexity of the flavors are able to shine through without being overpowered by lots of other ingredients. If you are wondering what to eat this with, a simple salad or vegetable side dish would work great. Though, my favorite way is to eat it with a nice piece of crusty bread, like a French baguette. Then I can use it to soak up that extra sauce! One of the best things about this low carb recipe is that it’s all cooked in just one skillet. Keeping up with a food blog is time consuming (albeit, tasty) work, so one-skillet meals are always very appealing to me. The meal gets cooked and on the table in no time, and clean up is a breeze. You can either use chicken tenderloins, or chicken breasts, cut into tenderloin-like strips, which is what I did. 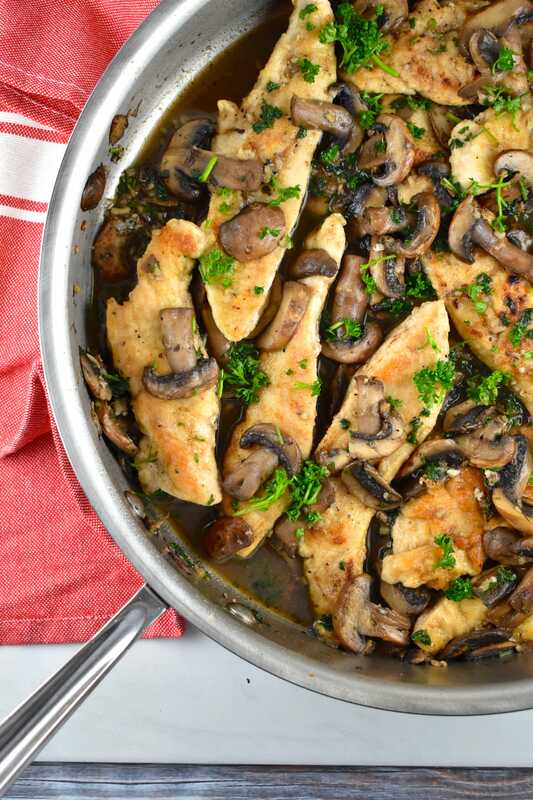 You could use just about any kind of mushrooms in this dish. 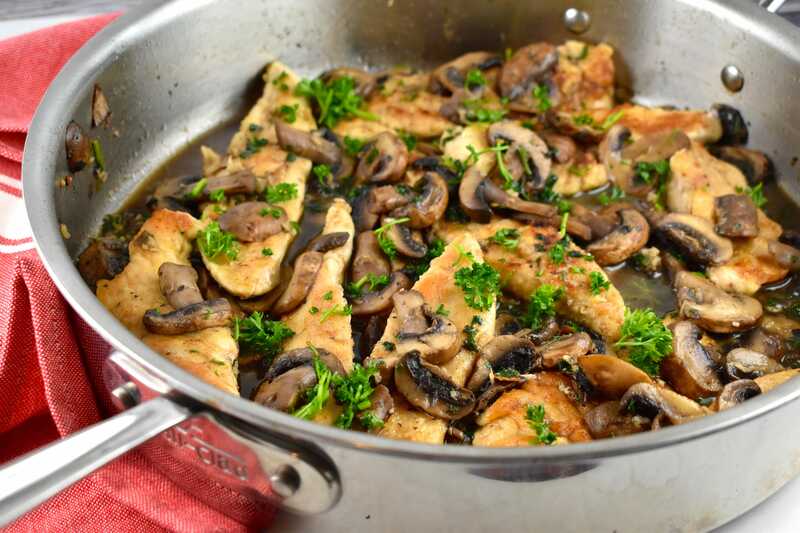 I used Crimini, but portobello mushrooms or even plain old white mushrooms would work fine too. If you don’t drink wine, you could replace it with chicken broth. But make sure to add in a few squeezes of lemon juice, because this recipe really needs that acidity. After you’ve cooked your chicken and have set aside, make sure you don’t forget to cover them with foil! This allows them to continue to cook a bit, and the flavor helps to capture all those incredible juices, and to keep them warm. If you try this recipe, make sure to let me know! Comment, rate it, and/or tag a photo #laalooshrecipes on Instagram so I can see it! I love seeing what you guys cook. An elegant and healthy dinner that takes little effort to prepare, but delivers sophisticated flavor. 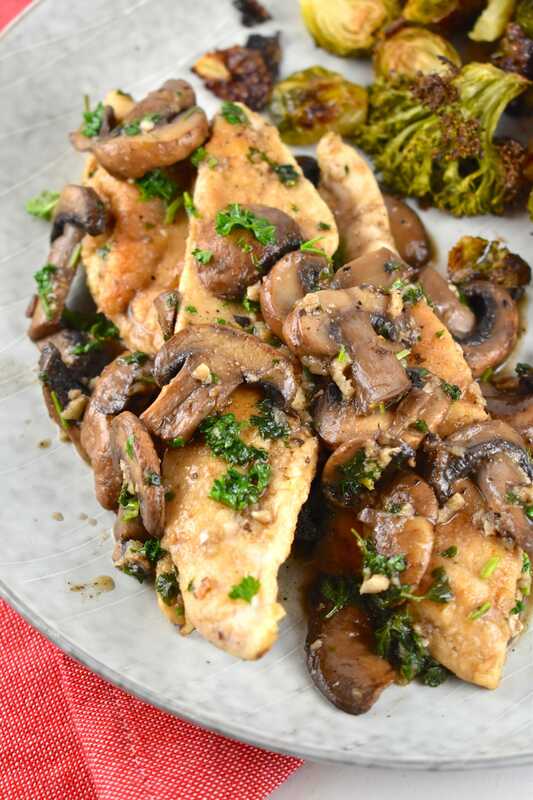 Tender, juicy chicken breast sauteed with earthy mushrooms in a velvety garlic wine sauce. Season chicken tenderloins generously with salt and pepper, then lightly dredge each piece in flour. Heat 1 tsp of olive oil in a large, non-stick skillet over medium heat. When hot, add ½ tbsp of the butter. As soon as the butter melts add the chicken pieces to the skillet, and cook for about 5 minutes on each side, or until chicken pieces are cooked through and is golden brown on the outside. Transfer to a dish and cover with foil to keep warm. Add remaining oil and butter to the skillet. Then add in the garlic, mushrooms, salt, and pepper, and cook, stirring regularly, until mushrooms begin to become tender, about 5 minutes. Stir in the chicken broth and wine, scraping up any browned bits from the bottom of the pan. Cook until the liquid reduces by half. 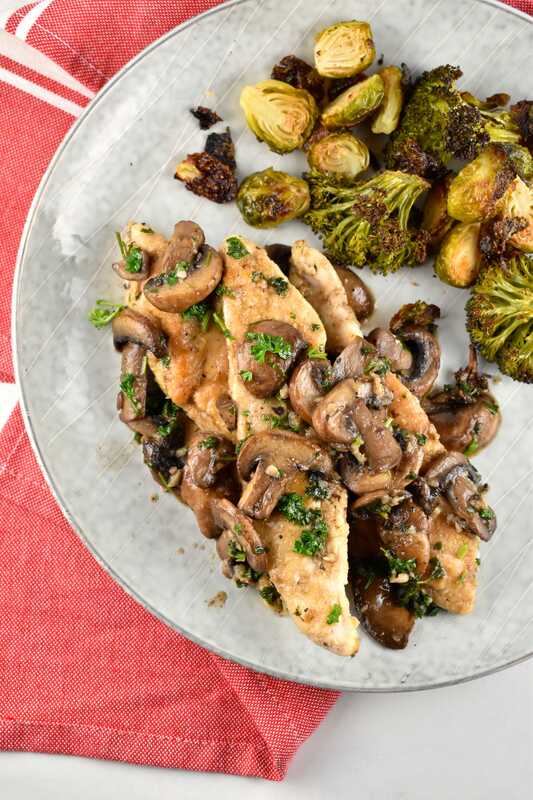 Return the chicken to skillet, and spoon the sauce over the tenderloins. Sprinkle in parsley, and cook for another minute or two until the chicken is hot. 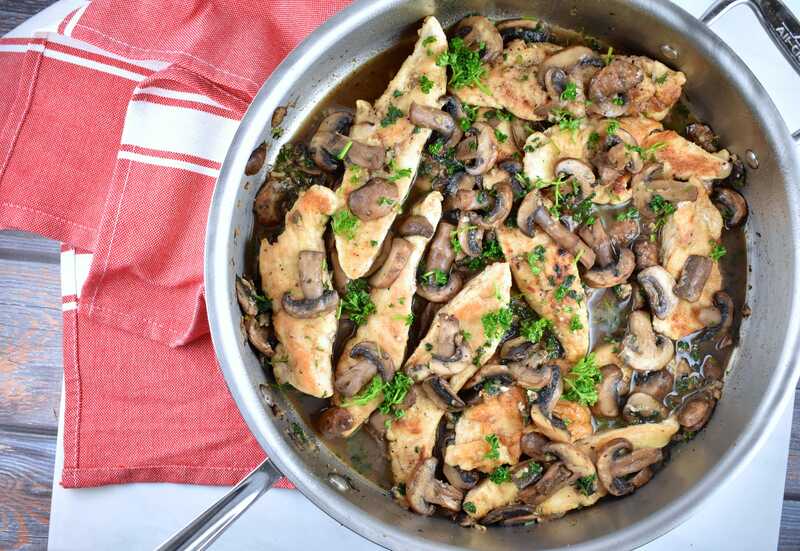 Transfer the chicken to serving plates and spoon sauce and mushrooms over top.